Our popular little Zen Triode amp model SE84B has been revised again! There is some history on this located in the specifications page for the Zen amp, but I thought it would be a good time to do an overview on the history of this little bugger, now that it has one! A good place to start would be the original design log, written during the first year of development. It will give you some insight into the birth of the idea and some of the ways I thought I might implement it. This paper will simply document the history of revisions and some of the things I've learned after hand building around 500 of these amps. The original SE84 was an EL84/6BQ5 based amplifier using a 12AT7 as the signal tube. It was configured as BOTH a single ended triode OR a single ended pentode amplifier based on the position of a switch on the front. 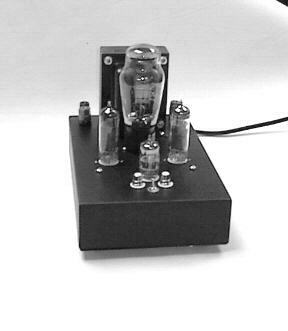 In Triode it was around 1.8 watts per channel and in pentode it was around 5.7 watts. There were 50 or so of these models built and close customer feedback was maintained with almost all 50. We learned that customers preferred the sound of the Triode of Pentode in all but one case. That meant a switch designed to offer two different sounds wasn't being used. It also meant that an amplifier designed to be both pentode or triode was not fully optimized for either. Then the revision A came out where we made some serious changes. First the output tubes shipped with the amps were now SVETLANA SV83's which are a high performance version of the original 6BQ5's. The power supply and circuit were redesigned to favor triode operation and at the same time the option of running the amp in pentode was removed. The switch on the front was then converted to a bias switch offering the customer two different signatures buy changing the bias of the signal tube. The signal tube was also replaced with a high performance version of the popular 6DJ8 by Svetlana called a 6N1P. These revisions made a large improvement in the sound of the amplifier, and at the same time we started building our own chassis with a durable finish of the highest quality. I personally hand built and drilled the chassis for the first 50 amps and if I never drill another hole in this lifetime it would be just fine with me. Even though the quality of the product went up with the fidelity, we kept it at the same $499. price because sales were just starting to get serious. Approx.. a year later, and after another year of experimenting, we modified the power supply again launching the sound of this amplifier into the big leagues. This was the beginning of our understand about speed issues within a circuit. Many people don't realize that it is actually the way you design and build the power supply that accounts for the fidelity of an amplifier. In fact it makes a much larger effect than the circuit itself. This modification took the amplifier into it's revision B and has solidly been getting rave reviews ever since. Now, after two more years of tweaking, and with knowledge gathered from developing our other products, We have redesigned the power supply one last time and resolved what is our current understand of speed in a way that improved the musicality of the already wonderful amplifier by a very noticeable margin. This new power supply also includes our own power transformers made here in the USA to spec just for our Zen amp. These power transformers are superior in quality and consistency to the Hammond power transformers we've used up until this point. The Eureka that caused this most recent revision was so good that it musically outperformed the supply in our Signature monoblocks at 5 times the cost. Fortunately this happened two weeks prior to the start of production of the new mono amplifiers, so the new power supply that is in the revision C is also found in part on the new signature mono blocks. It's one thing to experiment until your old and gray with documented modifications to amplifier projects but nothing like doing that obsessively and gathering feedback from 500 happy customers in 500 different systems/rooms. The priceless knowledge from that process is the sole reason why we don't sell through dealers. I personally talk to almost every customer in depth about likes/dislikes and wouldn't have it any other way. I often have flash backs to that first few amps, and the literally 1000's of hours of tweaking they got, and how I thought I was done and nothing could be improved. Then I come back to earth and look at where the product is at now and the gap between the two is huge. Unlike I would have ever imagined, I have realized that a truly great amplifier is the result of both the original design and the process and experience of building 500 more. That is probably the most interesting thing that has come out of this for me personally. Truly great amplifiers evolve. This means that if I wanted to design and build an amp from scratch for myself, like many of us solder-slinger's enjoy doing, no matter how long I labor over it to get it right the amp will ultimately not be as good as it would be if I put it in production and let it evolve over a few years in hundreds of different systems. This goes against my original motivation for building amps - which was that you can usually hand build an amp that sounds better than production amps you buy at the store. Both sides of this paradox are true. The catch is the circuit boards. Most production amps use them, we don't. To date, the things I've learned since the first Zen amp prototypes are so numerous I can't begin to explain them here. But I will say that the common denominator is the opposite of common understanding. The biggest obstacle in staying true to this intimate design process is deprogramming yourself. In audio, it would be far more likely that you would accidentally come up with something great if you had no idea what you were doing. I've noticed that everyone seems to copy everyone else, and most rely on the test gear and calculators too much. Around here the ears have it, regardless of what the scope says. In fact we never measure anything until we're completely done with it. Once you get honed in on something during the voicing of an amplifier, paper can be very distracting. In the end, if it sounds good, you'll find that it usually measures pretty darn good as well. I don't anticipate any more revisions to the Zen amp, but I said that after the B revision too. Sometimes the art in the science is knowing when to quit. Our attention now is on our signature monoblocks, and our tube line amp and preamps. These line level products will make it possible for those who already have high power solid state systems to taste some Zen. To ensure it's place in history, we are manufacturing SELECT versions of the Zen Triode that use the same parts as our Signature Gear, and clearly push the envelope of fidelity.